Jadielady: Wooo I feel like a RockStar! Wooo I feel like a RockStar! Last weekend, I participated on a Live Recording episode of Its a Purl Man. Well, for her most recent episode, Cat of Lets Knit 2Gether featured her recording of the chatroom! You can watch it right there on her website, or subscribe through Itunes. 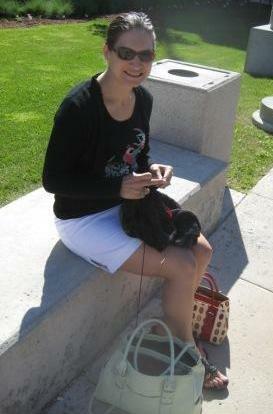 I also wanted to share today's feature of the Kitty Knits Blog tour. Anyone who names their cat Greedo is OK in my book. Purl This took a new spin on the interview, and has HILARIOUS reaction shots from her cats. Glad you enjoyed the interview - Greedo is trying to figure out how to translate his newfound fame into more food.